We go by minibus to Nikkaluokta. 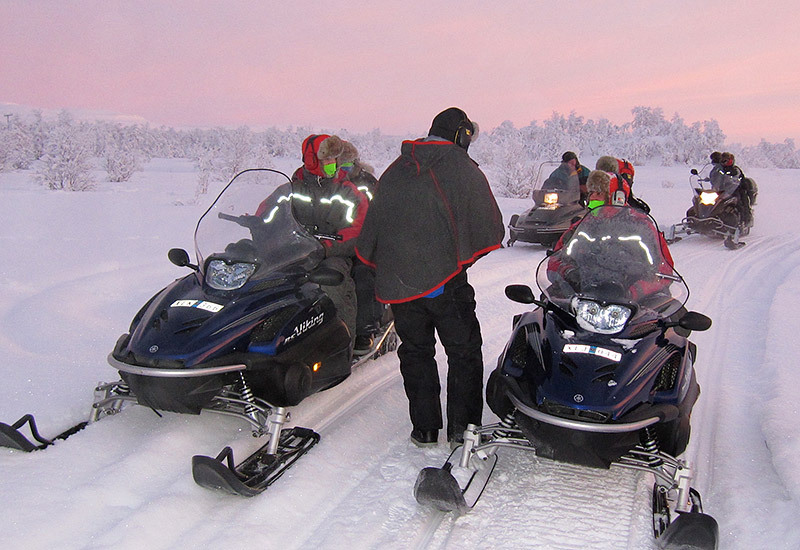 We change over to snowmobile and drive up to the mountain lake Láddjujávri where we will try some ice fishing and have lunch consisting of local delicacies. Around us we have high steep mountains and in front of us we have the highest mountain in Sweden, Kebnekaise. We are most likely to see several moose during our trip. The cabin where we will spend the night has electricity, toilet and shower. In the evening you can enjoy a sauna and dinner. After breakfast next morning we will get on the snowmobiles and head back towards Nikkaluokta and Kiruna. Price: 5675 SEK/Person, 2835 SEK/Child (up to 12 years). Pick-up from a hotel costs 150 SEK/person, 75 SEK/Child (up to 12 years). Duration of activity: 22 h.
Departures: December-April. (No tour 23–25/12 and 31/12). Starting point: Daily at 13.00 am at the Tourist Office in Kiruna. Pick-up from Ice Hotel in Jukkasjärvi will be 30 min. before the tour begins, at 12.30! Please note: You must have a valid driving license to drive a snowmobile. Persons without a license can ride on the back with someone else or with the guide. Small children will be pulled in a sled behind the guide.